Where to find daffodils and global warming! At the weekend I had a two-day workshop with the title of ‘Daffodils – Herald of Spring’. Looking into most gardens on the south coast of England, the daffodils were long gone, so how did I decide to teach this subject at this time of the year. 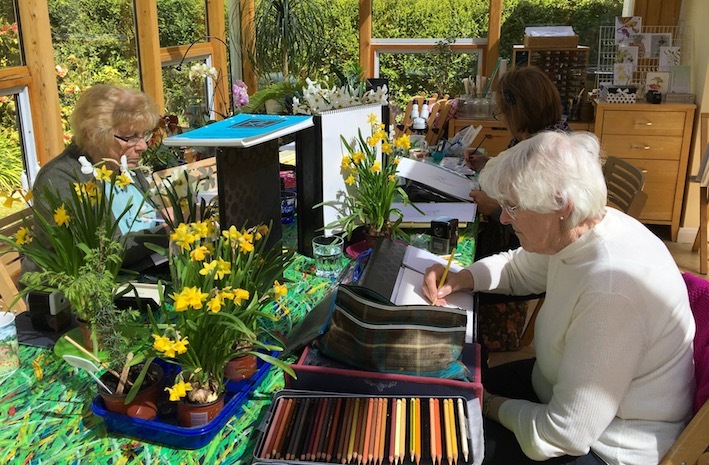 When planning my botanical art workshops, I look back at the photos I have taken of daffodils over the years and note the dates. Before my introduction into the digital age, I remembered that for my 49th birthday (21 years ago), we had snow (in the UK) and the daffodils were just coming out. Working from then until last year, I expected that there would still be some in the garden. If you remember last year the daffodils were extremely early and we thought that was that. But then we had a new flowering and rather than just a few odd ones, there was an almighty crop. Not so this year! Robin and I went trailing around Chichester and surrounding areas buying up what we could find. It was an interesting exercise. As you can see, in the end we found the remains of some tiny ‘Tête á Tête” bulbs still flowering, but also some Narcissi. Therefore the workshop was saved. As a note here, all my workshop titles where specific plants are mentioned, are just suggestions for subjects to paint. My workshops are not based on a step-by-step approach, but on individual support to improve your own technique. Here are several pictures from the workshop including a preparation page, a very rough sketch and a ‘before and after’ picture showing the importance of cleaning up around the image as a last task. I will let the pictures speak for themselves, but once again I met with some lovely, hard working botanical artists and I believe a good time was had by all. Now to prepare for the next two weekends, which is the Chichester Open Studio art trail. In addition to my usual exhibition space where my workshops are held, I will be doing some work towards pictures I will need to have finished before the end of the year. Robin will be looking after the exhibition and you will find me tucked away in the shed at the bottom of the garden. Do come and visit me at Venue 35 in Bosham. For more details visit page: https://gaynorsflora.com/exhibitions/.